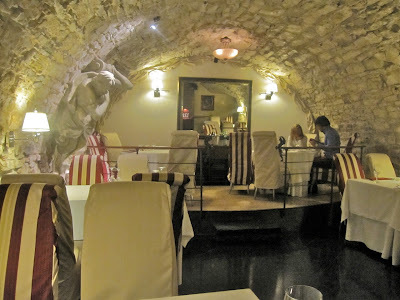 I thought I knew all the top Italian restaurants in Prague. Recently, one snuck in under my radar. I discovered this recently by reading The Prague Post's special section, The Best of Prague 2010. I was surprised to see that the editor's choice was a place I hadn't heard of before. Gabriele Ristorante is a new place in Old Town that took over the location once occupied by Flambée. It opened in late September. I did a little Googling on the owner and chef, Gabriele Feliciani. I discovered he has worked around the globe in many Michelin-starred establishments, running several himself. This intrigued me. Chefs of this caliber are not so usual in Prague. 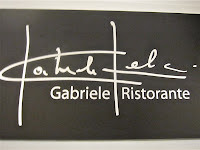 One night while on my way to try out a different restaurant, I found myself walking in front of Gabriele's. I decided to alter my plans. Since I was alone, I figured I could make my way through a five course tasting menu (1475 CZK) to get maximum exposure to the talents of the kitchen. 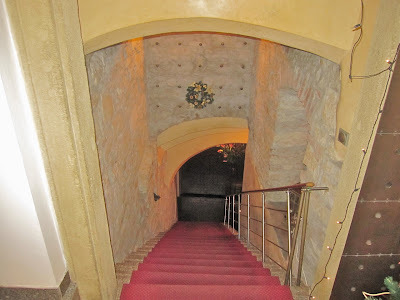 From the passage, I descended down the stairs into the subterranean restaurant. Only two tables were occupied in the main dining area. I was shown the slightly smaller but similar second dining room. The vaulted stone ceilings were brightly lit. 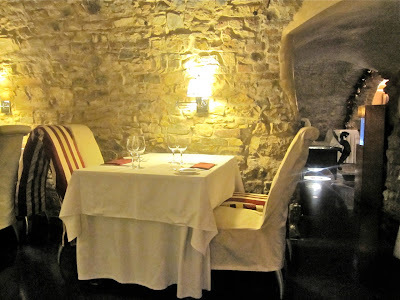 There is the feeling of being in a wine cellar or even a cave. Personally, I thought the look was warm and stylish. Ballads, light pop, and Sinatra played at a discreet volume over the sound system. It was still possible to hear the gurgling fountain in the next room. The cellar appearance is appropriate because the restaurant has quite an extensive and mostly expensive wine list. The cheapest I saw was the Centorame Trebbiano d'Abruzzo for 695 CZK, and there are a few bottles in the 900 CZK range. 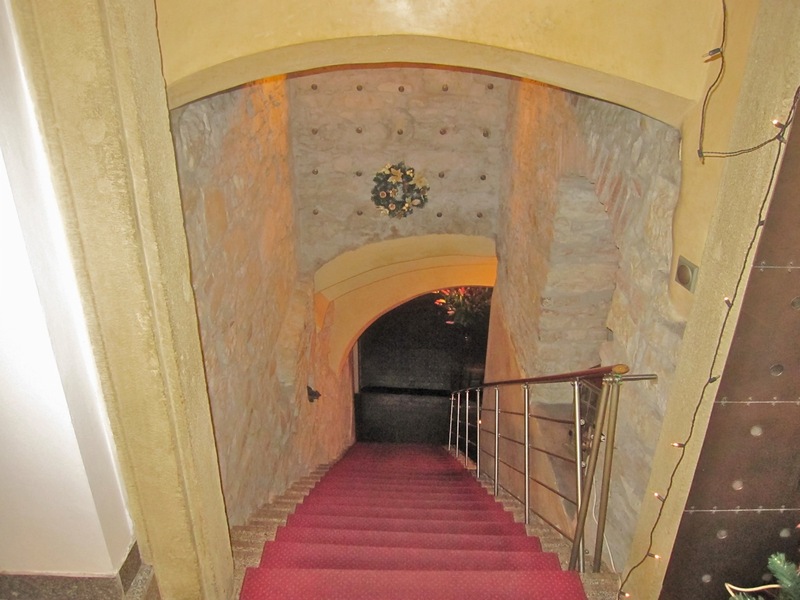 But the list has much more high-end stuff, topping out with the 1934 Château Branaire Ducru at 156,000 CZK. 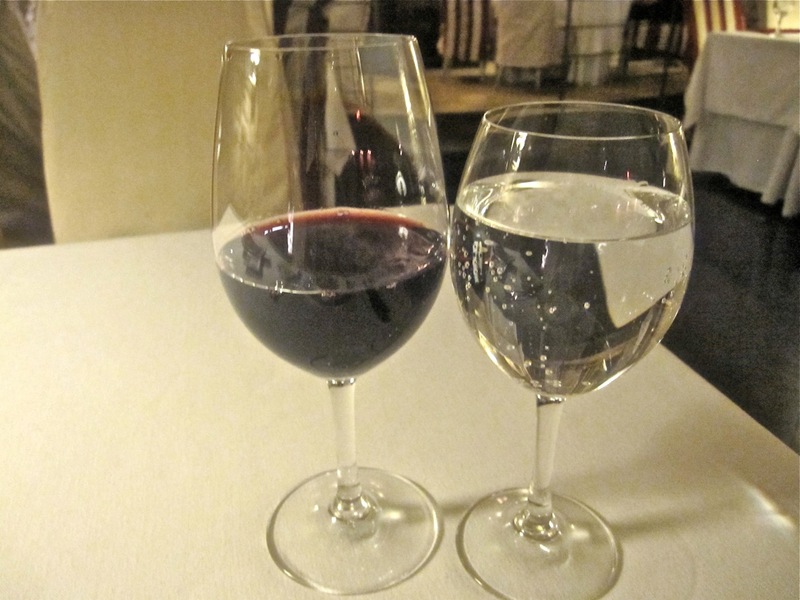 I didn't find wines by the glass on there, so I asked if it was possible to have just a glass of red. The server said he could recommend an Australian Cabernet Merlot from Cape Mentelle (290 CZK). I asked for that along with a .25 liter bottle of San Pellegrino sparkling water (55 CZK). This 2006 vintage was an excellent, dry, medium-bodied red with a wonderful bouquet. It had a hint of blackcurrant and very light tannins. I savored each sip throughout the meal. Bread was delivered. I also received a plate of aromatic olive oil. The waiter milled some pepper into it. 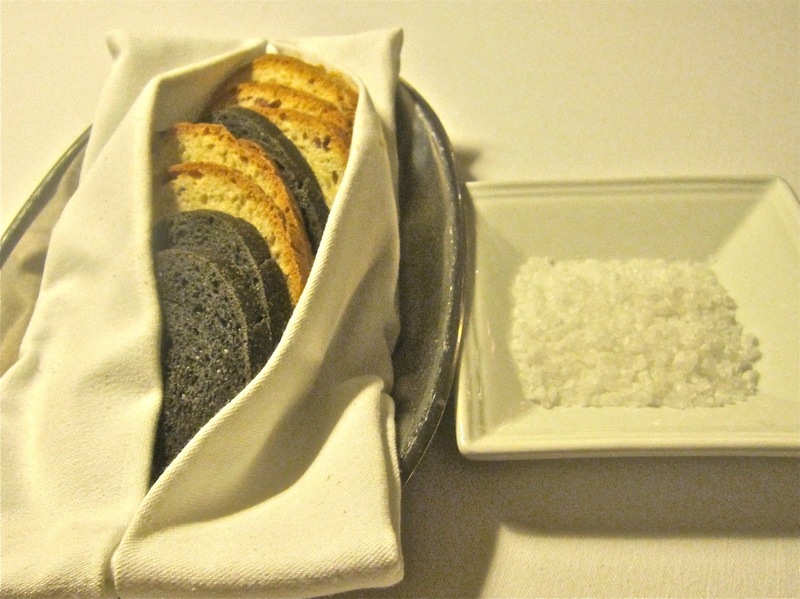 The black sepia bread and the white slices, which my English-challenged waiter said were made with "ham," were a disappointment. While there was squid ink coloring, I didn't detect any special flavor. Both were terribly dry. 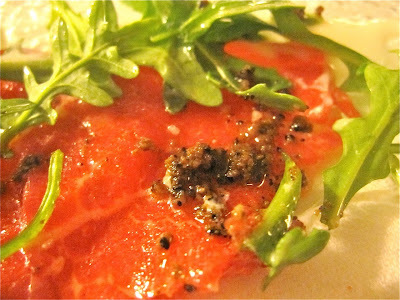 They crumbled and broke apart when I tore pieces off and disintegrated even more when I dipped pieces in the olive oil. 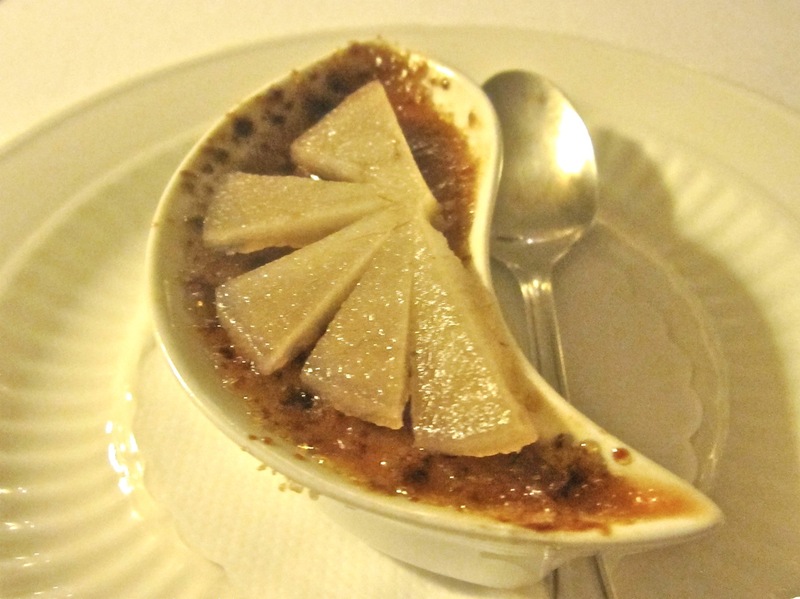 I then received a very generous amuse bouche, a foie gras brûlée, topped with frozen pear. The liver was creamy smooth and light. Very nice. The crust of burnt sugar and the fruit was a little too sweet for my taste, but I still enjoyed this offering. My waiter told me my five courses would be smaller than those ordered à la carte, but I'll give the prices for the full portions to give a sense of the cost of a meal. 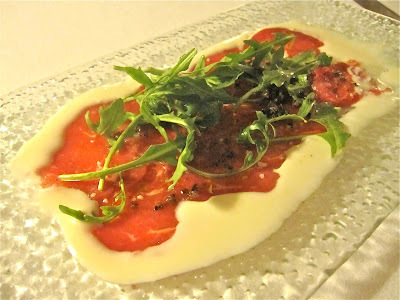 My first course was the beef carpaccio with warm goat cheese and Piedmonte truffles (395 CZK). The relatively thick-cut, fresh beef was the size of large coins. The buttery, silky meat was the perfect temperature, cool but not too cold, and surrounded by warm, liquefied goat cheese. It was a creative and successful complement. What also set this apart from more pedestrian versions were the small bits of truffle. Mixed with the salt on the meat, it added a subtle, earthy dimension with a light, nutty undertone. 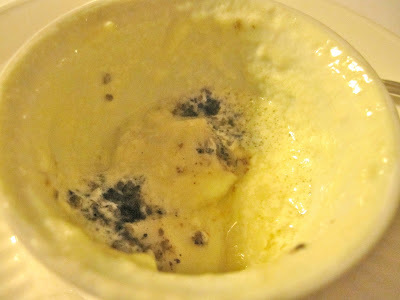 Next came the Truffle Cappuccino (365 CZK). 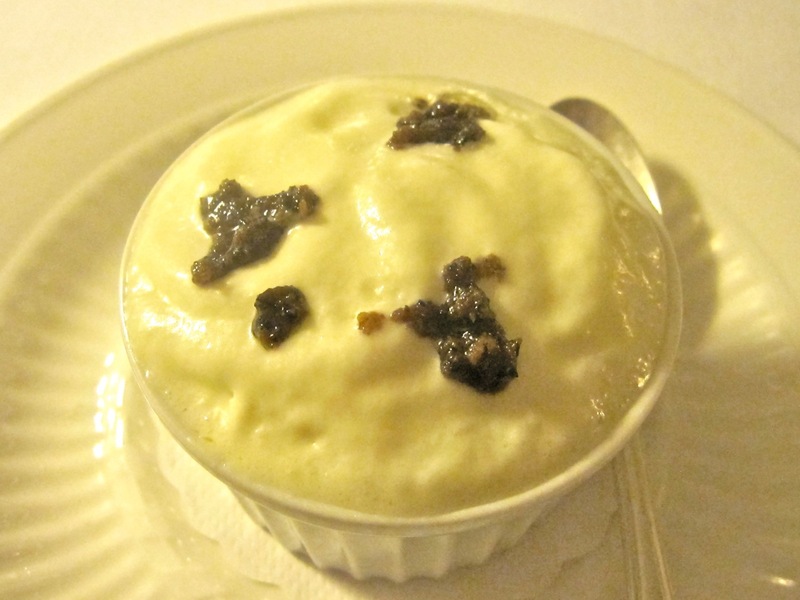 The white ramekin was filled with a light potato foam, topped by an even lighter mozzarella foam, topped by more morsels of truffle. Served hot, the first froth had a mild tang that is the essence of good mozzarella. I savored each mushroom morsel on top and they were gone too soon. Then, I descended into the slightly denser but still airy potato zone. Just as I was lamenting the paucity of truffles on top, I hit black gold at the bottom. There was a much richer portion of the pricey shrooms down there. I was pleased. This course was light in weight, but full of surprising and pleasurable flavors and textures. 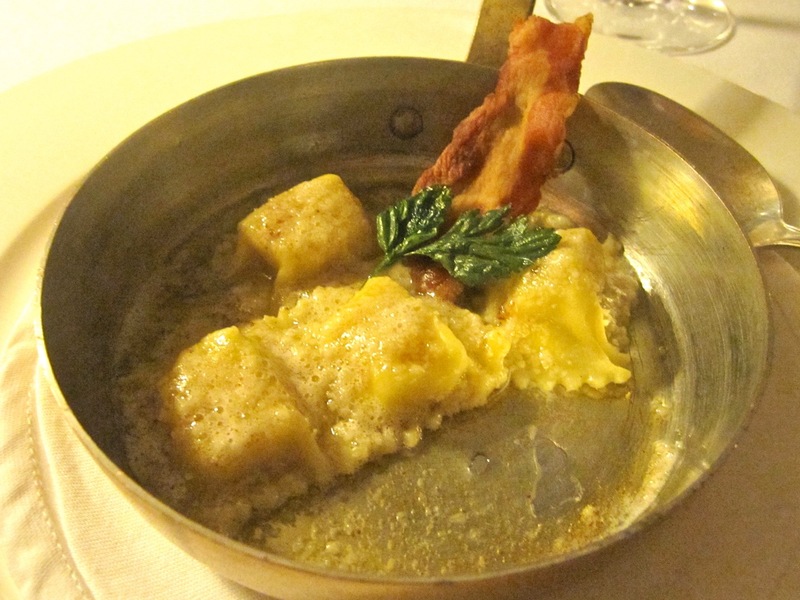 Course number three was ravioli with liquid goat cheese, goat milk and pancetta (295 CZK). I was advised to eat each bite-sized piece of pasta whole to let the flavors explode in my mouth. This also keeps the liquid from spilling out into the serving pan. Forgetting myself for a moment, I tried one before snapping the photo. The pasta was perfectly done, the goat flavors pleasurable, but not transcendent. I did not enjoy it quite as much as a similar dish I had two years ago at Aromi. There I had ravioli filled with liquid Parmesan surrounding beef tartare. That was more memorable. 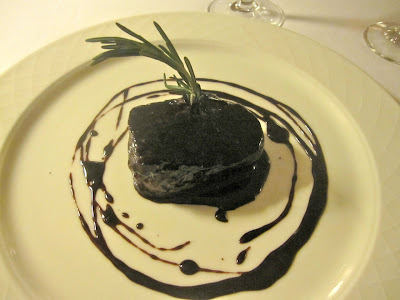 The fourth course was one that I asked for specifically from the menu -- the steak of Apennine beef with Barolo sauce (725 CZK). At first, I was told it would not be possible, but the waiter checked and the kitchen agreed to make me a small version. The sauce was the star for me. The syrupy glaze on the meat and was both acidic and sweet, though it might be too sweet for some. The perfume of the wine came through. I did the best I could to clean the plate at the end with the crumbly bread. I was less impressed by the beef. It was not particularly tender and the flavor was rather plain and average. Adding a touch of salt helped, but I've enjoyed many lesser-priced steaks more than this one. The similarly priced steak special I had at La Finestra is one that was memorably superior. 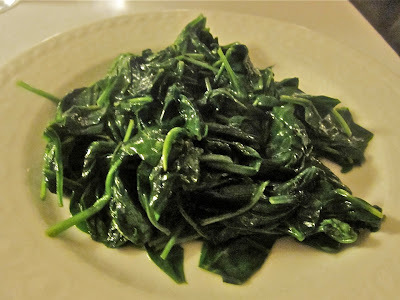 It came with a side of delightfully simple freshly wilted spinach. It was almost forgotten by the waiter and arrived a few minutes after the steak. Finally, there was dessert. There were a number of intriguing offerings on the menu, but I was told I would receive the homemade tiramisu (195 CZK). 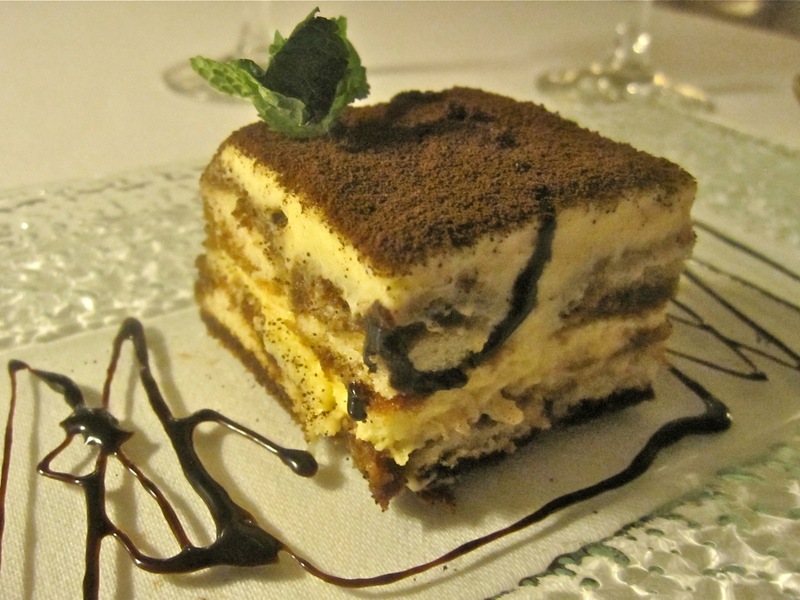 This one was made with tired sponge cake, with just a small amount of mascarpone. I didn't really get any coffee flavor from it and, overall, it was too dry. The only thing I found interesting was a pleasant, slow-building burn on my palate. I asked my Romanian waiter if there was some spice, but he was confused by the question in both English and Czech. The Italian manager came by and couldn't help either. Finally, the other waiter with better English joined the committee and told me there was a splash of Cognac in there. Mystery solved. During the discussion, I mentioned I wasn't thrilled with the dessert. I was told that they actually made two kinds of tiramisu and that this was the last of one batch. I was then offered a sample of the more classic version made with savoiardi biscuits. Indeed, it was much like many other versions I've had. It was certainly better, but there was nothing exceptional about it. The service varied from warm, friendly, and efficient to slightly confused on a couple of occasions. I had three different servers plus a manager attending to me during the evening. 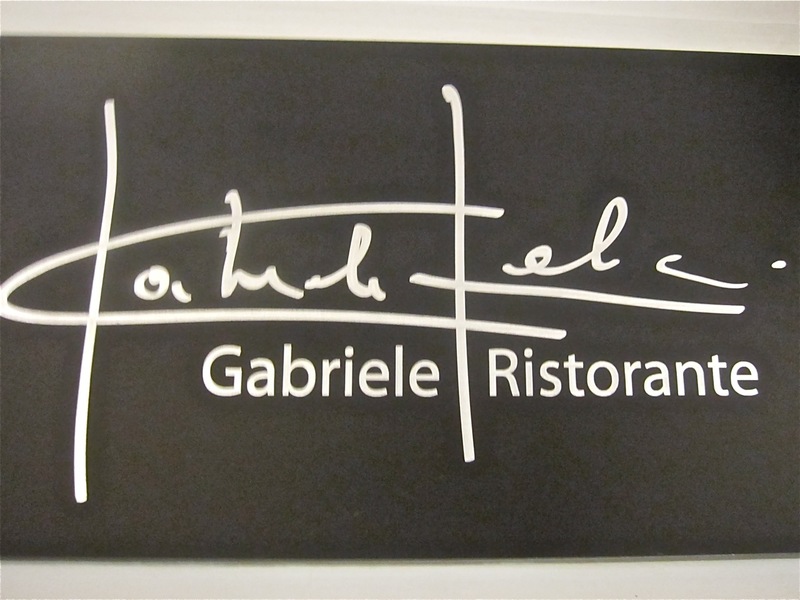 They did tell me that Gabriele was not in the restaurant that night. The final bill for my solo meal was 1820 CZK. I left a crisp 2000 CZK note. Was it worth it? I confess it's a struggle to answer this question. I guess that partly depends on how much money you have. 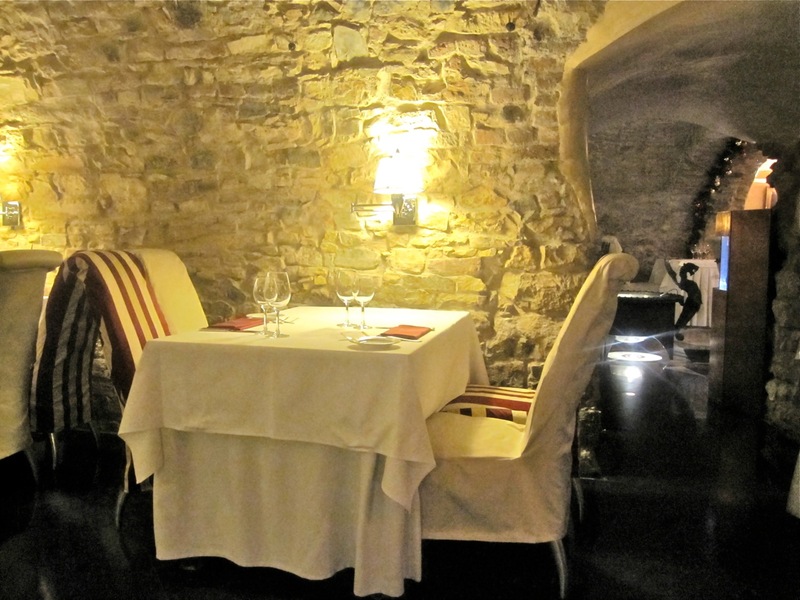 It's certainly not the most expensive restaurant in Prague, but it is definitely in the high-end of the scale. If you only had starters, pastas, and a glass of wine, you could get out the door for just 2000 CZK for two. Still, for this kind of money, I personally expect something close to perfection, and it didn't quite meet my expectations. There should be no disappointments. 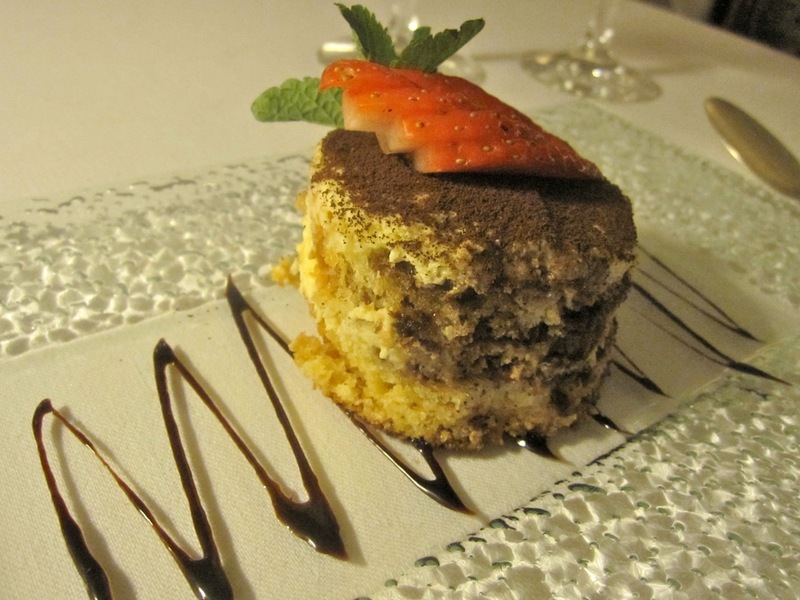 I wouldn't cross Gabriele Ristorante off my list for a big splurge. There are pleasures to be had there. But with potential competition from Aromi, Allegro, La Finestra, Divinis, and Da Emmanuel, to name a few, I think they need to do better. There are just too many other possibilities out there. I only want to prevent people who go to this "Lovely" restaurant, not to accept "chef's suggestions" before seeing the real price in the menu. 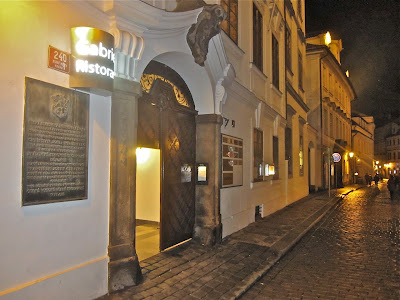 Last week end, we were about to have a "5 course selection" for the crazy price of 3000CZK per person(around 120 €), until the time a asked several times for the menu and realized that the real price was 1500CZK per person!!!!!!!! half price!!!!!! Fortunatelly, we were smarter than he was, and he couldn't manage to rip us off!! !